In late March, the beef industry was rocked by a meat scandal in Brazil that created concerns about quality and safety controls. Many countries, including China, temporarily halted imports of Brazilian beef while the scale and scope of the issues were sorted out. In light of these events, it is worthwhile to step back and reflect on beef trends (as we did a few weeks ago with corn here and here). This week’s post considers the global beef trends – including consumption, production, imports, and export. When it comes to beef consumption, the U.S. is the lead cow (Table 1). In 2016, U.S. beef consumption accounted for 20% of global beef consumption. In fact, U.S. beef consumption is well ahead of other top consumers; the European Union (E.U. ), China, and Brazil each account for 13% of global consumption. Overall, the top-ten counties account for 79% of global consumption. Growth in beef consumption is important to consider. To do this, beef consumption in 2016 are compared to 1990 levels (an admittedly simplistic, but still insightful, method). Globally, growth in beef consumption has been rather lackluster. During this period, global beef consumption increased a total of 19%, or at an average annualized rate of 0.7%. For context, corn consumption expanded at 3% annually over the same period. While both numbers are small, the difference is huge. For instance, the Rule of 72 would suggest that total corn consumption – given 3% annual growth- would double in 24 years while it would take more than 100 years for total beef consumption to double (at 0.7% annual growth). While the global trends are slow growth, the story is quite variable by country. Consumption in the U.S. has been even slower than the global trends, 0.2% annual growth. In other significant countries, Russia and Mexico, consumption has trended lower. On the other hand, beef consumption in China has been more aggressive with an annual growth rate of 7.8%. 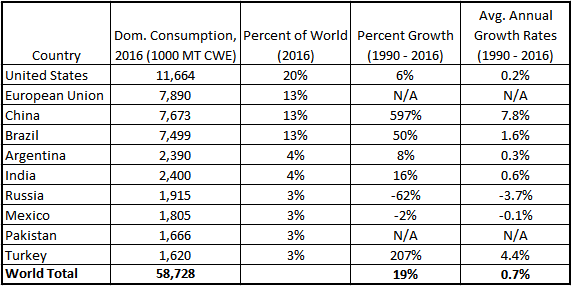 If this growth rates remained constant into the future (which is a big ‘if’), China would be the largest consumer of beef in 10 years (the Rule of 72 and an average growth rate of 7.8% suggest consumption would double in 9.2 year. A doubling of 2016 consumption levels would put China well ahead of the U.S.). One final comment on China’s growth in beef consumption. From 1990 to 2016, China’s increase in beef consumption was equal to 69% of total global consumption growth. So while growth in beef consumption has been slow, China has been the source of most growth. Table 1. Total Domestic Beef Consumption and Growth of Consumption in the Ten Largest Beef Consuming Countries as of 2016. Taking a look at global production trends and the top-10 beef producing countries in 2010 (Table 2), the list of counties is nearly the same (Russia made the consumption list, but was bounced by Australia for production.) Global production of beef from 1990 to 2016 was, like consumption, slow to expand at an annual growth rate of 0.7%. Also similar to the trends in consumption, U.S. beef production the same period was slower than global expansion at 0.3% annual growth. More broadly, U.S. production from 1990 to 2016 increase 9% total (not annually). Growth in global and U.S. beef production has been quite small. Beef production in Brazil, which is the second largest beef producer and accounted for 15% of global production, expanded 85% from 1990 to 2016; or 2.4% annually. Brazilian production grew at a faster rate than consumption trends during the same period (2.4% vs 1.6%). This sets the stage for Brazil to play an important role in global exports, but more on that later. The opposite trend occurred in China where growth rates were slower in beef production (6.8% annually) than consumption (7.8% annually). Again, while the differences between these growth rates seem small (1 percentage point), the impacts over time can be quite significant. For example, if two bank accounts both started with $100 but grew at the different interest rates (6.8% and 7.8%), after 10 years the faster growing rate would have a balance of $212, compared to $193 (9.8% more). Finally, a third country to note is Turkey. In both production and consumption, Turkey ranking 10th but experienced relatively large rates of growth. Expansion in production and consumption were nearly lock step as both increased at an average annual rate of 4.4%. Should these rate of growth be sustained, one could expect Turkey to quickly jump in the rankings over the next decade. Table 2. Total Domestic Beef Production and Growth of Production in the Ten Largest Beef Producing Countries as of 2016. Global beef imports are shown in Table 3 (note the time-frame has shifted due to data availability limits, 2000 to 2016). In 2016, total global beef imports were up 32% from 2000, or at an average annual growth rate of 1.7%. Many would be surprised to know the U.S. – the world’s #1 consumer and producer of beef – is also the largest beef importer. In 2016, U.S. beef imports accounted for 18% of total global imports. However, while the U.S. is a large importer of beef there was essentially no change in beef imports between 2000 and 2016. Given China’s production and consumption trends, it’s no surprise China’s growth in beef imports have increased in recent years. The rate of increase, however, is quick shocking. Since 2000, China’s imports of beef have increased at nearly 28% annually. This is a phenomenal rate of growth. For context, China’s beef imports skyrocketed from 86,000 MT CWE in 2012 to 825,000 MT CWE in 2016. This will be an important trend to monitor in the coming years. Beef imports in Hong Kong have also experienced large increases, up nearly 11% annually since 2000. Table 3. Total Domestic Beef Imports and Growth of Imports in the Ten Largest Beef Importing Countries as of 2016. Given it’s status as a large producer of beef, and growth in production outpacing domestic consumption, Brazil is a beef export heavyweight. In 2016, Brazil accounted for 20% of global exports. Furthermore, Brazilian exports of beef increased at an annual rate of 8.7% since 2000. The unexpected story in beef exports is likely India. In 2016, India exported the same amount of beef as Brazil. Furthermore, Indian’s export growth was substantially faster than those of Brazil (from 2000 to 2016: 11.1% compared to 8.7%). India is also very reliant on exports as 44% of production in 2016 was exported, compared to only 20% in Brazil. Don’t expect beef from India at your local grocery story anytime soon, however, as the meat is from water buffalo rather than cows. While the U.S. was the largest beef importer, it is also the fourth largest exporter and accounted for nearly 12% of total global exports. Finally, beef exports also rapidly expanded in Paraguay increased at an average rate of nearly 13% from 2000 to 2016. Table 4. Total Domestic Beef Exports and Growth of Exports in the Ten Largest Beef Exporting Countries as of 2016. On the surface, global beef consumption and production have been rather lackluster with slow rates of change in production and consumption. However, trends across countries has setup some interesting trends in the beef industry. With production growing faster than consumption, Brazil is an important beef exporter, along with India. Furthermore, consumption has outpaced production leading to a large increase in China’s reliance on imports. Looking ahead, all eyes will be on China. Will China repeat in beef what happened in Soybeans? China went from accounting for very little of total global soybean imports in the 1990s to more than 60% in recent years. Most recently, China has been working to open the door to U.S. beef exports. MT CWE= Metric Tons of Carcass Weight Equivalent.